GRADALL INDUSTRIES has produced a video to show how its strategic emergency response vehicle [SERV] FA 50 firefighting device can improve firefighting efficiency from a distance of up to 15.2 metres, while also helping to protect firefighters from traditional dangers. 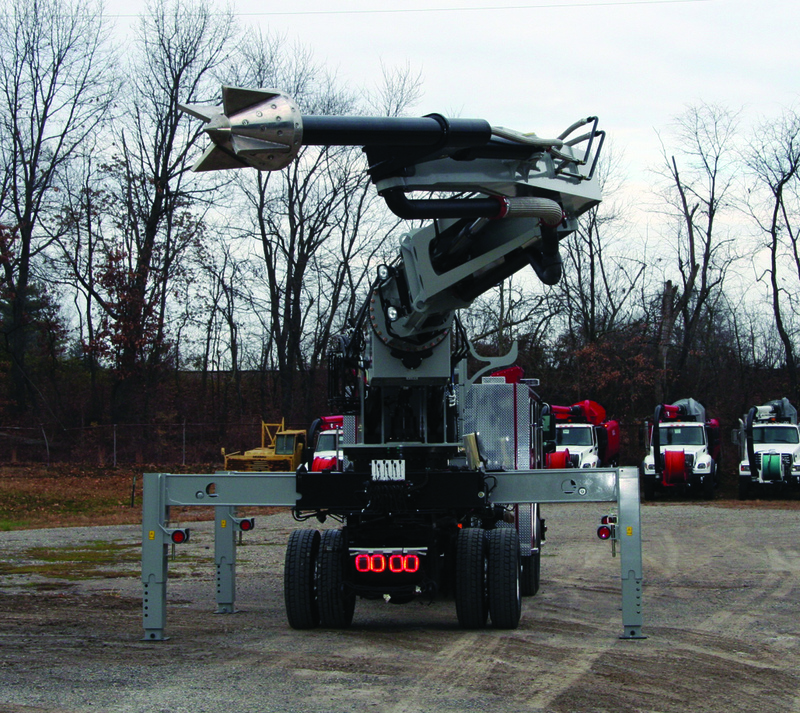 Designed and built by Gradall Industries, the SERV FA 50 features a rugged hydraulic boom, fully operational with a wireless remote control device that allows firefighters to stand and position themselves for a better view further from danger. Telescoping out 15.2 meters, the firefighter commands the boom to perfectly position a stainless steel fifth-man water cannon that is mounted at the end of the boom. The rugged fifth-man can efficiently ventilate buildings by breaking through walls and roofs and reaching through windows. After breaking through, the boom rotates the fifth-man 220 degrees as its 52 aqua jet nozzles direct a massive curtain of water into the fire. For chemical fires, the device also can dispense Class A or Class B foams. Often eliminating the need for firefighters to enter burning structures or stand on roofs for manual ventilation, the FA 50 remote device can be operated from over 61 meters away. For extra convenience, and to reduce firefighter fatigue, the remote device can be affixed to the firefighter’s belt. The FA 50 can be mounted on trucks produced by leading fire truck manufacturers. The FA 50 frame includes four stabilisers – also controlled using the wireless remote – for short jacking capability. Stabilisers telescope out and down, and can be positioned all at once or independently. Two hydraulic motors: Swing 20hp (15kW) @ 1.0 rpm; tilt 20hp (15kW). Hydraulic system: 0 to 160 litres-a-minute, up to 400 psi. Telescoping Boom: Reach 15.2 metres, rotation 110 degrees, tilt left or right. Fifth-man Water Cannon: 5,670 litres-a-minute and 120 psi, Class A and Class B foam.